It is an ayurvedic treatment for concentration problems, a natural herbal formulation to fight daily stress. It provides healthy nervous system naturally. 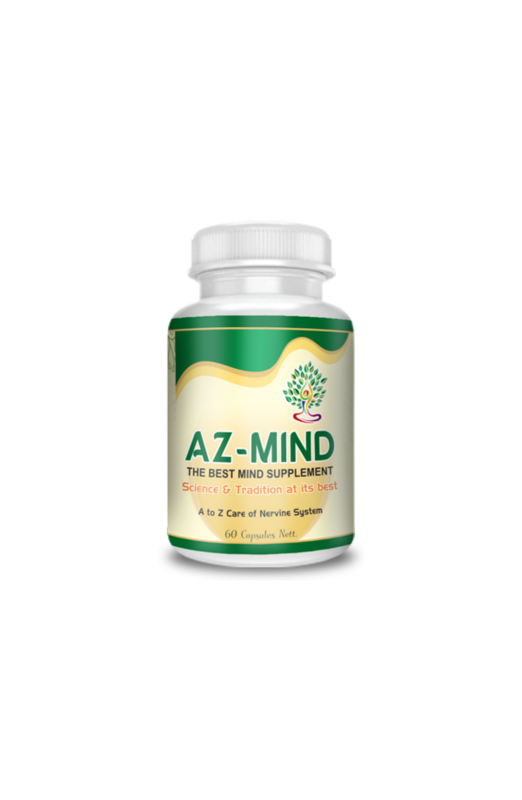 AZ Mind is an answer to memory, It is an ayurvedic treatment for concentration problems and a natural herbal formulation to fight daily stress. It provides healthy nervous system naturally, It is an natural herbal stress and fatigue care formulation. It also enhances physical and mental ability to fight stress. It also promotes memory in all aspects like learning, retention naturally. AZ Mind contains the herbs which have safe history of usage for many centuries in Ayurveda (Indian herbal system). Particularly for thousands of years for improving the level of brain in all the terms like in sharpening the memory and decreasing the stress level. We may say that experience modifies the structure of the mind, i.e., through the persistence of their modifications; the past experiences influence present behavior and mental process. Brahmi (Centella Asiatica) - If the effects of daily stressors are getting the best of you, brahmi supplementation may be something to explore. Stress reduction is perhaps brahmi’s most well known, traditional use. Nir Brahmi (Bacopa monnieri) - Brahmi oil has refreshing effects on mind, used as mental tonic that helps in focused concentration, increasing memory power, mental alertness, amnesia and alzheimer’s. Jatamans (Nardostachys jatamansi) - Jatamansi is a natural brain nervine tonic and a memory enhancer, which has calming, peacefulness and relaxation features. Shankpushpa (Convolulus pluricaulis) - It has been claimed as one of the few herbs which reduces stress level and puts brain in a relaxed state. Ashwagandha (Withania somnifera) - Ashwagandha has been traditionally used in Ayurveda to improve both physical and mental health. Malkangni (Celastrus paniculata) - Malkangani is best suited to increase memory power It sharpens your will power and is a good memory enhancer. Varch (Acorus calamus) - Steaming the root of calamus throughout the home is believed by many to cure certain types of sickness. Harar (Terminalia chebula) - Steaming the root of calamus throughout the home is believed by many to cure certain types of sickness. Amla (Embilica officinalis) - If made a regular part of the diet, Amla has been known to improve eyesight. Dhania (Coriandrum sativum) - It soothes the brain chemicals and helps prevent brain damaging factors and conditions by controlling the neuro- chemicals discharge in brain. Mirch (Piper nigrum) - It is antibacterial properties, pepper is also used to preserve food. It is a rich source of manganese, iron, potassium, vitamin-C, vitamin K, and dietary fiber. Yashti madhu (Glycyrrhiza glabra) - It should be thought of during times of both physical and emotional stress, after surgery or during convalescence, or when feeling tired and run down. Sahatavri (Asparagus racemosus) - Shatavari is also especially useful in nourishing and calming the nerves, nourishing the brain and helping to support the brain and the body in regaining balance from vatadisorders like spasms, pain and insomnia. Vaividang (Embellia ribes) - It is an effective nerve tonic and helps to cure conditions like epilepsy and paralysis too. It is boiled in milk along with garlic for this purpose.